Animation of Venus' southern polar vortex made from VIRTIS thermal infrared images; white is cooler clouds at higher altitudes. Our neighboring planet Venus really is a world of extremes; searing surface temperatures, crushing air pressure, sulfuric acid clouds…Venus pretty much pushes the envelope on every aspect of rocky-planet existence. And now here’s one more thing that made scientists do a double-take: a shape-shifting vortex swirling around Venus’ south pole! The presence of a cyclonic storm around Venus’ poles – both north and south – has been known since Mariner 10’s pass in 1974 and then afterwards during the Pioneer Venus mission when a downwardly-spiraling formation of clouds over the planet’s north pole was imaged in infrared. It wasn’t until ESA’s Venus Express orbiter arrived in 2006 that the cyclone at the south pole was directly observed via the Visible and Infrared Thermal Imaging Spectrometer (VIRTIS) instrument…and it proved to be much stranger than anything previously expected. Rather than rotating centrally around the geographical pole – like Saturn’s southern vortex does – Venus’ vortex rotates around a varying point averaging several degrees of latitude away. Its shape is inconsistent too…sometimes it is S-shaped, other times it is a double-eyed figure-eight, and yet other times it becomes completely irregular. 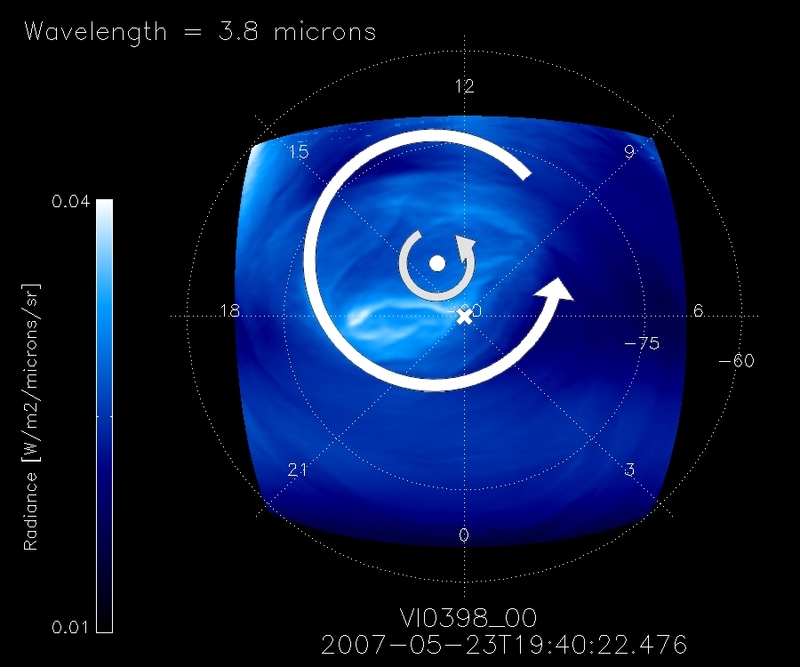 These changes in form happen rapidly over 24-hour periods, a result of the powerful wind shears created by varying speeds and alternating directions of the wind streams around Venus’ polar latitudes. Venus’ atmosphere typically rotates in a retrograde (east to west) direction at much higher speeds than the planet itself rotates. But near the poles, the wind speeds slow and change direction to prograde (west to east), which creates zones of wind shear. This in turn affects the movement and morphology of the vortex. And this is all just in regards to just the southern vortex…Venus’s northern vortex may prove to be just as unusual, but since Venus Express’ orbit takes it close to the north pole it’s impossible to get a wide-angle look there. Investigation of that region will have to “wait until further missions”, according to project scientist Håkan Svedhem. Currently funded until at least 2014, Venus Express will have more opportunities to study the structure of the southern vortex, giving scientists more info on the curious nature of our neighboring planet’s surprising and dynamic atmosphere. The results of this study are published online in Science Express on 7 April 2011. Other authors of the paper were: by D.L. Berry of the University of Évora, Portugal; G. Piccioni and R. Politi of INAF-IASF Rome, Italy; P. Drossart and S. Erard from Observatoire de Paris, France; C.F. Wilson of Oxford University, United Kingdom; and F. Nuccilli from INAF-IFSI Rome, Italy. For more in-depth sciencey info read the Science Express article posted April 7, 2011. Gee, this looks like those videos shot during medical exams. It’s ok Mr Mike, this won’t hurt a bit. wow. that is way cool and awesome. would be nice to drop some probes down there. i’m picturing the kind of things they used in the move Twister to study tornadoes. something like that could probably be done pretty cheap too. that is, of course, if NASA has any budget left after Obama gets done. maybe a job for ESA? bah. make that MOVIE instead of MOVE. It would be cool, but creating probes/spacecraft that could survive very long on Venus is harder than it sounds. The atmosphere’s sulfuric acid clouds tend to dissolve sensitive electronics, and the kiln-like heat and pressure at Venus’ surface is, quite literally, crushing. For now we’ll have to rely on Europe’s orbiter for our on-location updates! Earth’s Ozone Hole is bad enough…now this! Vortex cosmology is practically a theory of everything, and the math is all there. √[2×(zebra / glockenspiel)^3] = Vortex Cosmology!